As I mentioned in my recent post on "XP Practice Champions", in our first XP Adoption review we identified stand-ups as a practice to focus on and improve. 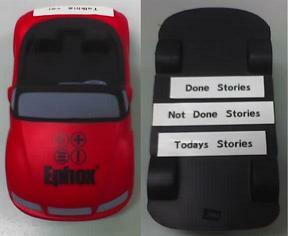 The introduction of the "Talking Car" was one of the ways we focussed on improving stand-ups. before tossing it to someone else in the group. With this list, we can address why a story wasn't completed, what we can do to complete it, advise the client of the delays and continue to communicate to the entire team what is being worked on. By focussing on successful story completion and communication of progress to the client hopefully this will also help with our improvements to Weekly Iterations. This entry was posted in Agile and tagged Ephox. Bookmark the permalink.